The Hofmann family of Samuel and Blümche was a founding family of the Jewish community of Themar. Like other families such as the Walthers and Müllers, the Hofmanns moved from the village of Marisfeld to Themar in the mid-1860s when the law allowed them to do so and when they realized that the larger urban place would offer more opportunity for their growing family. As well, children of Samuel and Blümche married into other major core families of Themar such as the Frankenbergs, who also came from Marisfeld, as well as the Sachses, who came from Berkach. Unlike many of Themar’s core Jewish families, the Hofmann family moved on from Themar completely; in other families, such as the Baers and Gassenheimers, some children moved to other, usually larger centres, but one member remained in Themar. 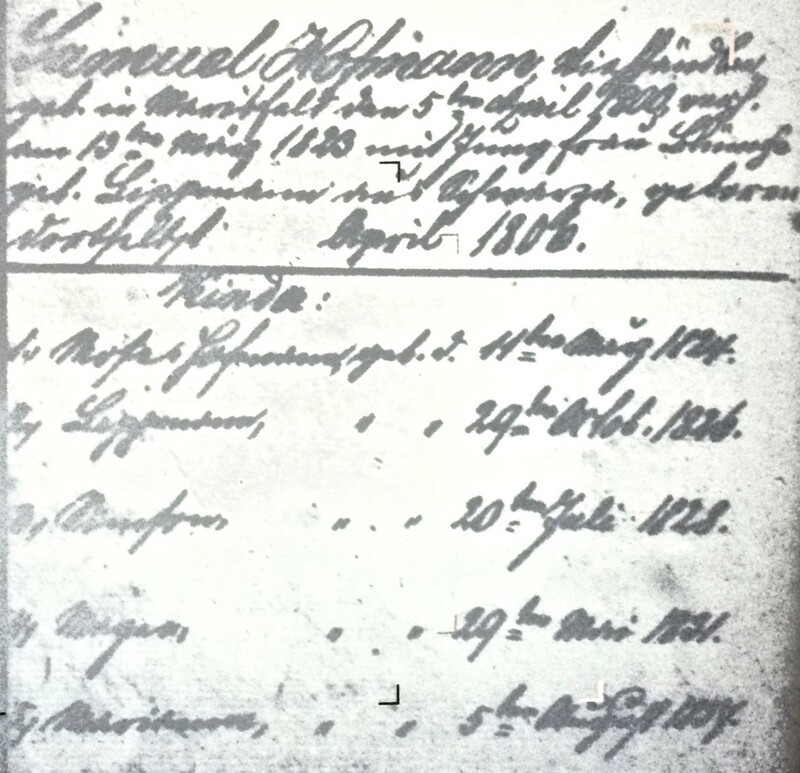 This did not happen with the Hofmann family; twenty years after their arrival ini Themar, there was no longer a member of the family in the Kleinstadt. Samuel Hofmann was born in Marisfeld in 1800; his parents’ name and circumstances of their presence in Marisfeld are not known. In March 1823 he married Blümche Lippmann from Schwarza. They had four children in Marisfeld, Simson, b. 1823, died at 8 years of age. In 1852, the eldest son, Moses, left Germany for America; we believe that the entry below records his entry into New York. We know most about the family of Lippmann Hofmann, born 1826. He married Riecke (Friederike) Sachs of Berkach in 1856 and initially they lived in Marisfeld. 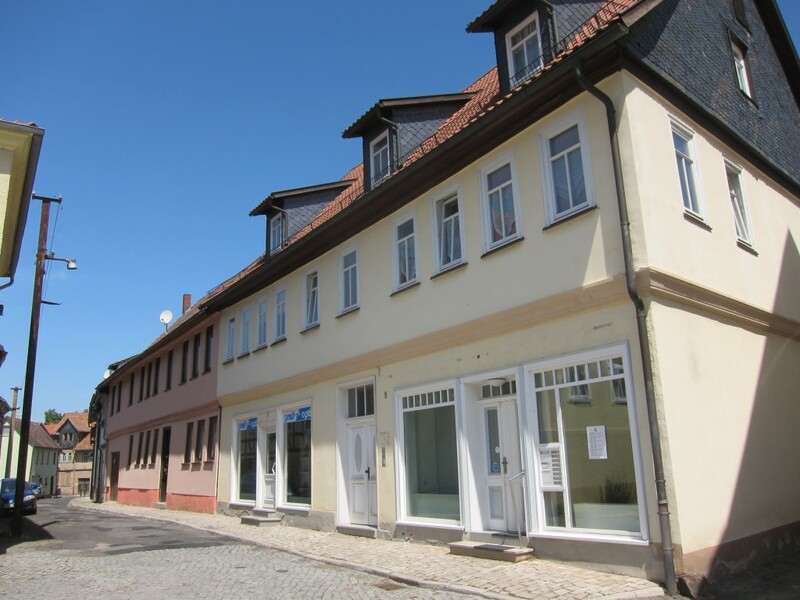 At some point after the birth of Frieda in 1865, the family moved from Marisfeld to Themar, one of several Marisfeld Jewish families who moved from the village to the Kleinstadt in the mid-1860s. In Themar, Riecke bore another 5 children. Traubengasse and Marktplatz, Themar. Credit: Meen. Entry in 1875 List of Themar Residents. Stadtarchiv Themar. and Blümche. Lippmann was identified as a trader/Handelsmann. In November 1883, Lippmann and Riecke Hofmann, and some of their children — we do not know exactly how many — moved to Jena. There, they lived at Löbdergraben 14. 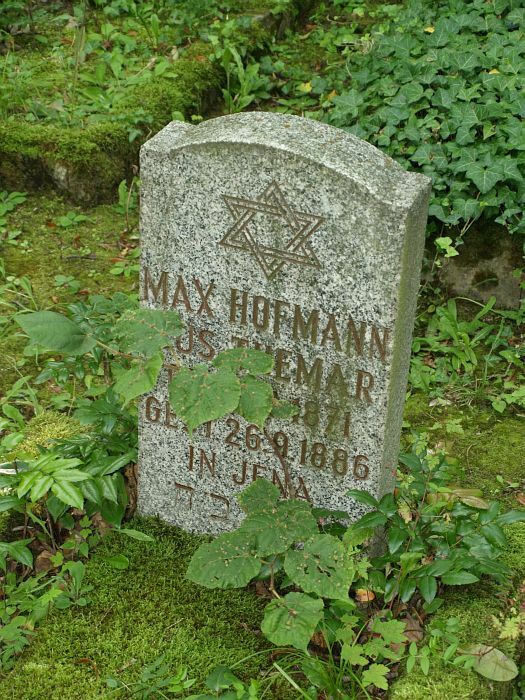 Son Max died on 25 September 1886 and was buried in the Jewish cemetery. (Photo). Lippmann Hofmann died in 1904. Moritz Hofmann, who had at first lived in his parents’ home, moved into his own quarters at Löbdergraben 34 with his wife Jetty (née Moses) in 1906. Moritz was a cattle dealer and operated a business with brother-in-law Abraham Frankenberg, husband of Regine Hofmann, at Löbdergraben 14. Salomon Hofmann, Moritz’s younger brother, and his wife, Frieda née Plaut, also lived in Jena. They lived at Löbdergraben 34 and ran a real estate business and a tobacco products business at Lutherstraße 9. On the 28 November 1909, their one child, Paula, was born. In 1910, Salomon’s mother, Riecke moved in with Salomon, Frieda, und Paula. Friederike died in 1917. In an 1977 interview with the United States Holocaust Museum, Paula Hofmann, Salomon’s and Frieda’s daughter, described the life of her parents and grandparents. As well, Ulrike von Wölfen has written about the family in her chapter (in German) ,,Zwei jüdische Biographien: Eduard Rosenthal und Paula Ehrenberg,” Paula and her husband, Heinz Ehrenberg, were able to flee Germany in 1940 for the United States. From there, they tried to bring Salomon and Frieda to America but, as the card in the Jewish Transmigration Bureau indicates, their attempt failed; the file was closed in June 1942 and the Ehrenbergs were refunded their deposit. Ancestry.com. Jewish Transmigration Bureau Deposit Cards, 1939-1954. From May until September 1942, Salomon Hofmann person between the NS authorities and the Jewish community of Jena. On 20. September 1942 Salomon and Frieda Hofmann were deported from Jena to Ghetto Theresienstadt; two years later, they were transported further to Auschwitz where they were probably murdered upon arrival. 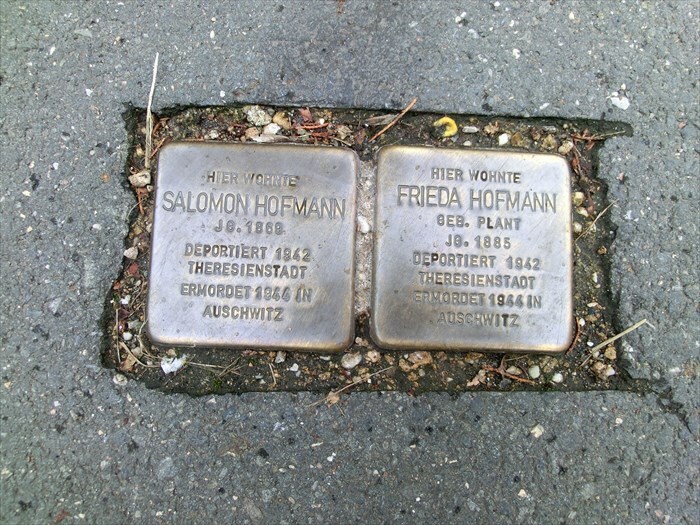 On 7 May 2008, Stolpersteine were laid for Salomon and Fried (née Plaut) Hofmann in Lutherstrasse, Jena. The Descendants List below identifies members of the family of Samuel and Blümche (née Lippmann) Hofmann. It is complied from the Jewish Registers of Marisfeld and Themar. 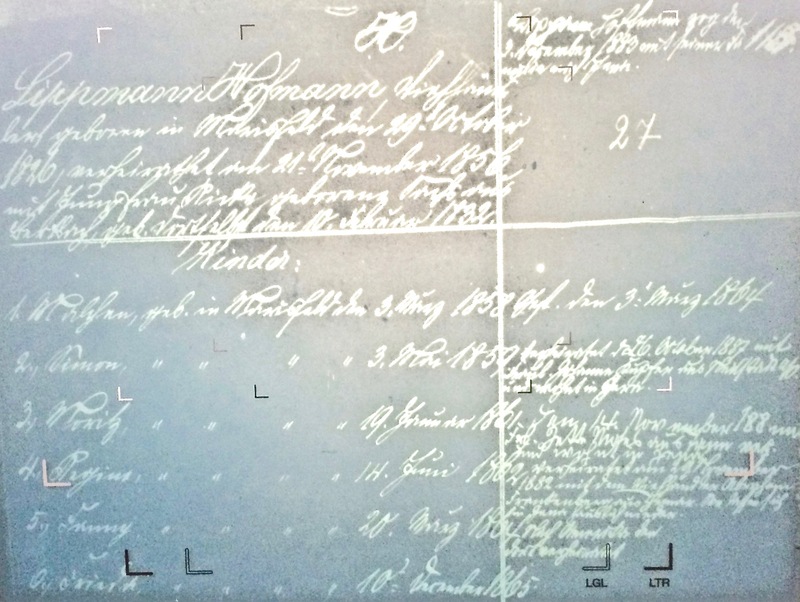 The Matrikel/Jewish Registers, which were read in microfilm format are poor as the copies in this page illustrate. But that is what we have at the moment and we are grateful. Of much importance in the case of this family is the evidence in the Matrikel of Marisfeld that the family came from Marisfeld, not from Mansfeld in Saxony, as several sources, such as the German National Archives, Memorial Book, entry does. 3. Friedel HOFMANN, b. 19 Apr 1893 Jena, 01 June 1939 to England, d. 25 Apr 1983 Manchester/Eng. ∞ Joseph PALASTRAND, b. 1907, d. 17 May 1959 Salford/Eng. ∞ Sally HERTZ, b. 12 Jul 1882 Coesfeld, d. 12 Mar 1938 Czech. Jenaer Arbeitskreis Judentum, Hrsg. Juden in Jena. Eine Spurensuche. Jena: Glaux Verlag, 1998.